Why is it okay for Manning to run the score up when Brady was slated for same? Peyton Manning is scooping up awards and accolades at the same rate Matthew Stafford throws picks, and in general receiving positive press for doing something Tom Brady and the Patriots were widely scolded for doing in 2007: Namely, running up the score. Why the different attitude 6 years on? In 2007 the New England Patriots set the NFL alight with some absolutely stunning football. In a perfect fusion of attacking, offensive football and smothering, point vulturing defence, the Brady Bunch swept all before them in the regular season, driving hard to a perfect 16-0 record. Some of the scorelines are, to this day, shocking. Only 4 times all season did the Patriots fail to score 30 more more. They scored over 40 4 times and over 50 twice. From weeks 6 through week 8 they scored a stunning, 48, 49 and 52 points. The Patriots offence was like a hungry Great White shark in a tiny swimming pool with fat, lazy salmon. It was no contest. At first a kind of a stunned silence. Then some rather angry accusations of running the score up, particularly from teams and writers that were beaten by the bigger scores, for example here and also here. Scoot forward a few years to 2013, and Peyton Manning and the Denver Broncos are setting records that are actually breaking the ones the Patriots set, for example the total Touchdowns thrown, 50 by Brady, now 51 and counting by Manning. The Broncos have put up several lopsided scores and have continued throwing late into games also. Nothing short of sycophantic. The mainstream media have been involved in a season long Manning love-fest that is in danger of spiralling out of control. Manning is everywhere, goofily grinning down from billboards, ads and interviews, joking around with Ron Bergundy and basically being rammed down our throats by ESPN and the rest 24 hours a day, 7 days a week. The man can do no wrong, even when repeating exactly what Brady did a few years ago, something that, at the time, people declared it very wrong indeed. Why is this the case? 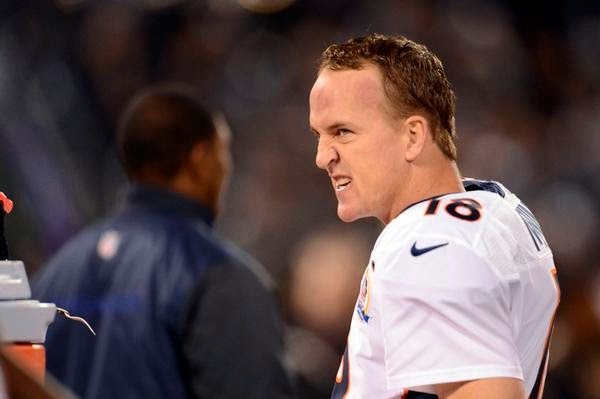 Why can Peyton Manning get away with it? Perhaps it is his goofy demeanour and enormous forehead? 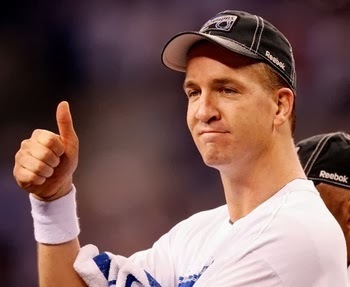 Manning admirably has no issue whatsoever making fun of himself in the National media. He seems like a pretty decent chap, and it would appear that long gone are the days where Manning would throw his own team mates under the bus, as with the Colts a few times after bitter losses (mostly to the Patriots). Whatever about Manning's enormous forehead, perhaps the most logical reason people in general aren't as intimidated by the '13 Broncos as by the '07 Patriots is, Denver just aren't that good. Not only have they lost 3 games, which is 300% more than the '07 Patriots, they have lost to Brady and the most recent, very flawed version of those very same Patriots. Basically, Denver are a circus freak show, they can put up points on a record pace when the situation is in their favour, however when push comes to shove they will most likely fold under the pressure of a relatively predictable offence (stick 9 near the line of scrimmage and Manning has nowhere to go) and a frankly horrendous defence. They just aren't that scary. Unlike the '07 Patriots, who sucked the very life out of several franchises on their way to that stunning 2007 regular season. 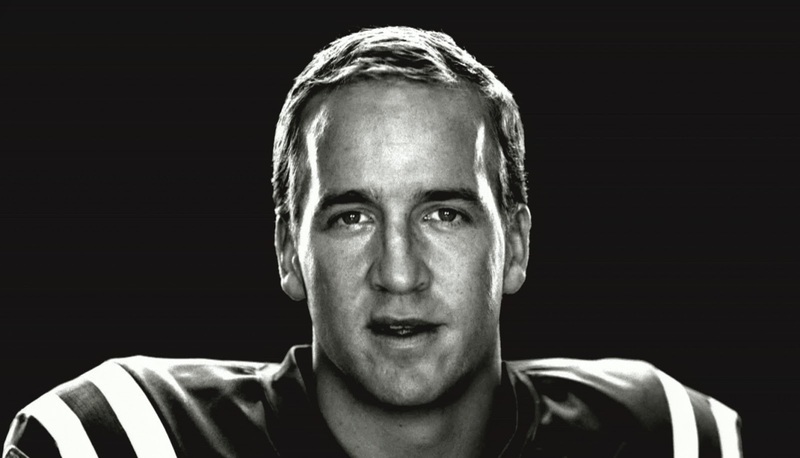 Maybe it's the Broncos 3 losses and inability to stop even the worst opposition scoring on them, maybe it's Manning's gigantic rectangular forehead and effortless goofiness. Whatever it is, it's fascinating to watch the media sycophantically pour adulation on Manning for doing exactly what Brady did 6 years earlier to, at that time, choruses of boos and angry scribes bashing on their keyboards. It's amazing what a difference 6 years can make.